How Much Does Global Warming Cost? A new report suggests that the social cost of carbon — the economic damage done by one ton of carbon dioxide emissions — could be drastically higher than government agencies have estimated. Most people understand that global warming is happening, but it is hard to get a firmer sense of exactly what effects it is going to have on the future of the world. Governments have started to approach climate change as a situation to evaluate using cost-benefit analysis: How much should we spend to fix the problem? How much will it cost us if we don&apos;t? As Judith Schwartz detailed in February ("The Social Cost of Carbon"), the U.S. government began regulating carbon dioxide emissions via the Environmental Protection Agency&apos;s enforcement of the Clean Air Act. The U.S. calculated the social cost of carbon — the economic damage done by 1 ton of carbon dioxide emissions — through an Interagency Working Group made up of many different cabinet departments and agencies. They estimated the economic damage per ton of CO2 to be just $21, or only about 21 cents per gallon of gasoline. A new peer-reviewed report, "Climate Risks and Carbon Prices: Revising the Social Cost of Carbon," by economists Frank Ackerman of Tufts and Elizabeth A. Stanton of the Stockholm Environmental Institute, suggests that the true cost of carbon most likely is drastically higher than either government&apos;s estimates. The report was published by E3 Network (Economics for Equity & Environment), "a national network of economists developing new arguments for the active protection of human health and the environment." Of the government&apos;s $21-per-ton number, the authors admit: "Such low costs are difficult to reconcile with the belief that it is urgent to take action to address serious climate risks." But how much do they think it costs? Rather than start from scratch, the authors used the same models as the government’s working group did, tweaking them only to account for a few “big uncertainties." The uncertainties boil down to these two: First, an estimation should take into account how quickly global warming will occur. Second, it is simple enough to understand that the economic damage will be greater in the longer term as temperature rises, but it is less certain exactly what it will cost and when. The calculation has to be built on this interrelated range of possibilities, from the mild to the catastrophic. How do their findings compare with the government’s? "Our re-analysis, including those factors, shows that the [social cost of carbon] could be much higher [than $21 per ton]. In our worst case, it could be almost $900 in 2010, rising to $1,500 in 2050. If the damages per ton of carbon dioxide are that high, then almost anything that reduces emissions is worth doing." In terms of a policy response, the authors conclude that it is likely that the social cost of carbon is either equal to or far greater than the maximum amount that could feasibly be spent on reducing emissions. "It is unequivocally less expensive to reduce greenhouse gas emissions,” they write, “than to suffer climate damages." It&apos;s doubtful that the current Congress will respond in any way to Ackerman and Stanton&apos;s report. Rather than addressing the economic damage created by pollution, for example, it’s defunding the government’s enforcement of its existing energy efficiency standards. In Australia, Gillard told the nation that a carbon tax, while assessed on big companies, ultimately will be felt by individuals. "Some of the cost paid by big polluters will be passed through to the prices of the goods you buy. The price impact will be modest but I know family budgets are always tight. So I have decided most of the money raised from the carbon price will be used to fund tax cuts, pension increases and higher family payments." If Ackerman and Stanton&apos;s analysis is correct, Australia&apos;s new carbon tax is probably far too low. But it is a huge and praiseworthy step to go from large companies having no accountability for the negative externalities of their carbon pollution, to having some accountability. From there, the amount of the tax can change as our understanding of the social cost of carbon changes. The first step is the hardest. Robert Socolow, the co-author of an influential plan to reduce carbon emissions, revisits his work seven years later to understand why it failed. As Americans argue about how to tackle the issue of climate change, the astonishingly rapid industrialization of China is threatening to negate whatever progress we might achieve in reducing greenhouse gases. According to a new analysis by economists at two University of California campuses, China's carbon dioxide emissions are growing at a far faster pace than previously estimated -- and earlier estimates were worrying. Reducing global carbon dioxide emissions will be an even more daunting challenge than we have been led to believe, according to a sobering commentary in the April 3 issue of Nature magazine. 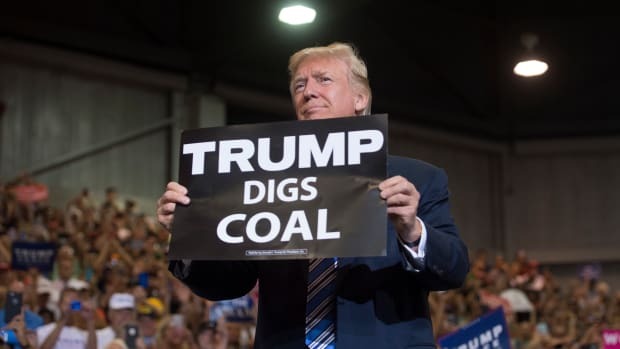 A protracted delay in the Trump administration coming up with its own carbon-cost estimate could empower environmentalists pursuing legal challenges to mining.